Recording DX audio greatly benefits DXers in a variety of ways. Some DXers may wonder why they should record everything they receive on the radio. Having an audio file of an FM logging serves as proof of the reception, but it also provides a way for you to reminisce about previous DX openings by replaying recorded audio files, too. You can also record from the radio while you are asleep or away from your radios, and easily go over recordings at a later time to pull out station IDs. Most importantly, recording audio files can even allow you to log new signals that you previously did not hear or forgot to note during a strong opening. More on that later. Recording audio from the radio is a fairly simple task and doesn’t require a lot of equipment. Outside of a radio, a computer sound card with a line-in input is a must. To connect the radio’s audio outputs to the computer’s line-in, a patch cord would be needed. I use a simple RCA to 1/8″ headphone jack cord which can be purchased at Amazon, Best Buy, Target, or other stores. I use Total Recorder ($17.95 for the standard edition as of 6/13/16) and Wavepad (free as of 5/8/13 for home use). Although I highly suggest Total Recorder to get the most out of unattended recording, you could substitute any standard audio editing program in lieu of Wavepad–just make sure the program can allow you to view, and edit, waveform. Total Recorder, seen above, acts as a VCR and can be programmed to record any length of time from whatever audio the computer is picking up via the line-in or (depending on settings), or the computer’s stereo mix. The program is very valuable because it records in the background and it doesn’t seem to take up any computer resources. It is a set-it-and-forget it type of program and definitely worth the $17.95. 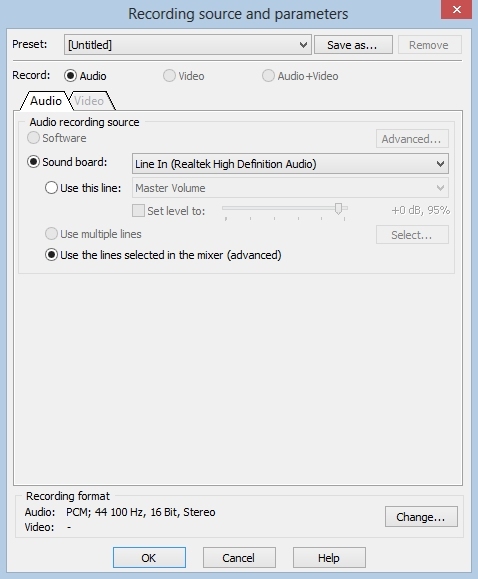 Best of all, you can set your computer audio to mute the line-in from the ‘playback settings’ dialogue box so you can listen to something else (mp3s, etc.) as Total Recorder records the airwaves. You won’t hear the radio, and your radio recordings won’t have whatever else you were listening to in them. Of course, you can choose to listen to the live recordings as it happens, such as during a Sporadic E opening. 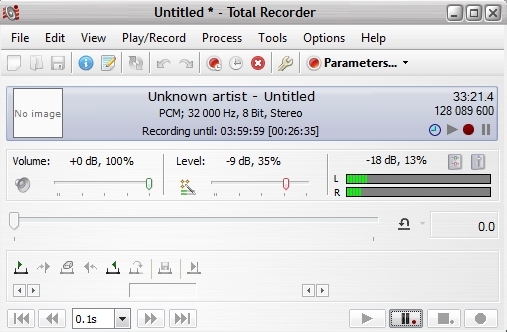 The cost for Total Recorder is a must-do, however–the free version of the program apparently puts noise into the finished product–something we don’t want! You can see a representation of my recording timers I use daily below. I have my Total Recorder set as seen above. I use a stereo recording format for reasons that I’ll explain why further down. Whether you use a mono or stereo recording timer depends on what you want to get out of recording DX audio–it is fine either way. Audio files in .wav format from Total Recorder are roughly 220 MB per hour, so make sure you have ample hard drive space. Since you would be saving clips of station IDs and other content you want to keep, you will be able to delete the master hourly audio files afterward. I delete the files daily (after extracting IDs) and keep my hard drive empty. Wavepad is used to listen to the audio recorded from Total Recorder. 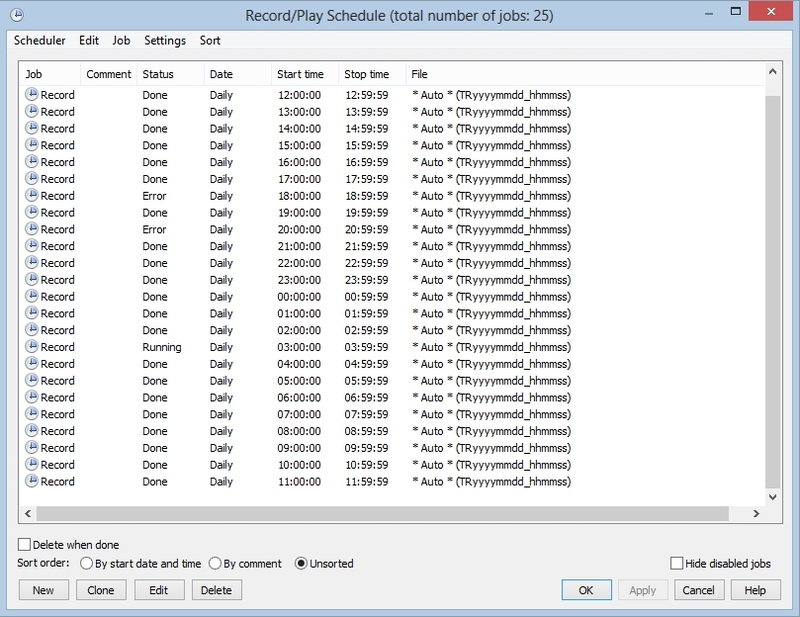 The hourly files typically take 10-20 seconds, each, to load on modern computers. 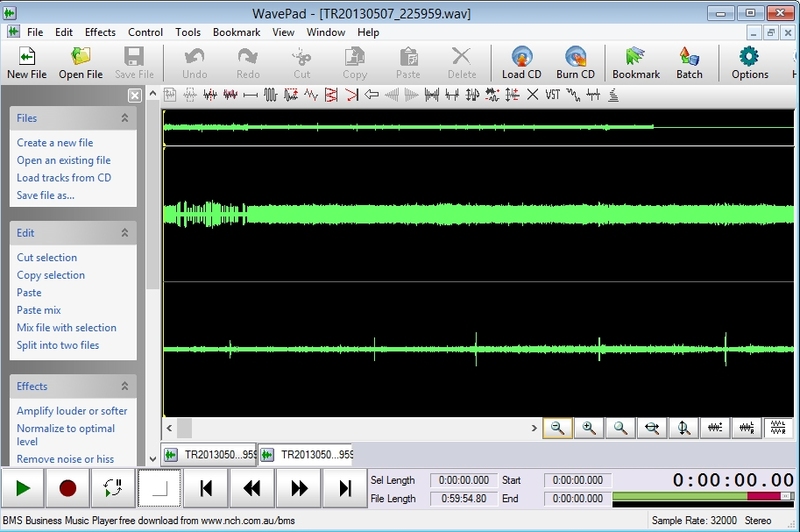 When a sound file is opened in Wavepad, it appears as above, with a mini ‘preview’ green line at the top, the left audio channel on the middle, and the right audio channel on the bottom. While in Wavepad, it is easy to see all propagation methods of DX, which is especially handy in unattended recording. The two ‘spikes’ in the left in the picture above are meteor scatter ‘pings’ and the oval-like portion is tropo (E-skip looks the same). Simply hit ‘play’ and utilize the editing features of the program to save the audio clips, if needed, in a new file. Due to space limitations on my website, I typically save the finished audio clips as a 64 kbps mono mp3 file, which sounds fairly clear. Having one or more radios could increase your chances of logging more stations simultaneously during a DX opening. Thankfully, it is possible to record two radios at the same time on a computer and be able to ‘pull’ out separate content from both radios. I use the Denon TU-1500RD and Sony XDR-F1HD radios in my shack. The Denon is connected to the ‘left’ audio input of my computer’s sound card, while the Sony is connected to the ‘right’ audio input. Recording in stereo, as seen in the Total Recorder settings above, allows me to easily record from two radios at the same time. Although the end result is a stereo file, the audio from each radio is effectively mono. However, mono audio has no effect on DXing and can, in many cases, make it easier to listen to weak signals. During intense Es and Tr openings, I actively DX both the Denon and Sony radios and I wear headphones. It may seem counter-intuitive to listen to two unrelated signals at the same time during Es. I admit, at first it is very awkward and confusing. However, training your brain to listen to two different audio sources at once maximizes the DX you can log. For example, during most Es openings, I put the Denon radio on 88.1 and tune up. At the same time, I put the Sony on 107.9 and tune down, trying to find the MUF of the Es opening. Often, I’m met with Es at 107.9 and I can DX both ends of the band at once, often logging many more stations at the same time than if I only used one radio. I note times on a piece of paper and then, at a later time, match my notes to the audio file to help identify signals. As you may know, most of the time with DXing is waiting for a song to finish. When listening to two radios at once, you can train your brain to ‘tune out’ one station playing a song and then have it come back to your attention once the song is over for potential IDs. It also helps at the top of the hour to utilize two radios, as you may pick up two different, distant affiliates of the same radio network. In this instance, the audio on both radios should match except for local station breaks/IDs. Don’t worry, you can go back and pull out separate IDs from the audio recordings to ID each station. When I am pulling out audio content in Wavepad, I can take one of my earbud headphones out and listen to only one ‘side’ of the recorded stereo file, and then (utilizing the channel tools in Wavepad which only copies-and-pastes audio from one of the two recorded audio channels) extract IDs and other content to save in separate files without disturbing the unrelated recordings (from the other radio) on the other audio channel. During strong openings, I basically go through each audio file twice, once for the left side, and again on the right side). Since Wavepad has a timer on the bottom right of the program, the timing will be identical to your computer’s clock. For example, if an ID was heard at 10:35 AM, the 10:00 AM audio file will have the ID you want to hear at 35 minutes into the recording. Although having a way to record and extract IDs from active DX openings is a huge asset in the DXing hobby, the ability to log FM stations when you are not at your radio is also a major plus of utilizing Wavepad and Total Recorder. I typically pick two open frequencies (free of listenable signals and IBOC interference) and record from them 24/7. When I have some time, I go over the recordings in Wavepad (a full 24-hour day can take up to 30 minutes to review if there’s no new logs or anything needed to be researched for a potential ID). I tend to pick quiet frequencies which afford the best chances for meteor scatter. Having a quiet frequency also makes it more easy to spot stations fading in when reviewing the waveform. However, if you have active frequencies with tropo signals, I still suggest recording those, too, as you’ll never know what you’ll hear. It will just be a little more difficult to review the hourly files, since you have to wade through unwanted audio content. In due time, you’ll often find new FM signals fading in from the noise level, or a new FM station in via meteor scatter. Or, if you are away from your radios during a Sporadic E-Skip opening, you can record anything the radio picks up. On 5/11/07, I had my radios set to record 91.1 FM while I was in college. Between 11:00 a.m. and 2:08 p.m., I logged KCFN Wichita, KS, KUCV Lincoln, NE, KTPR Ft. Dodge, IA, WOLW Cadillac, MI, WGGL Houghton, MI and KNOW Minneapolis, MN all from the same Es opening–stations I would not have logged had I not been recording 91.1 FM while I was away. The often changing selection of radio stations on one frequency allows you to get multiple stations often at the same time. Click above to hear audio via unattended recordings from 91.1 KCFN Wichita, KS, received via E-Skip at 1089 miles on 5/11/07. If you utilize unattended recordings in hopes of nabbing Es while you are away, I suggest you choose low-band FM frequencies (below 96.1 FM) first, as you may entirely miss an opening if the Es MUF doesn’t climb high enough into the FM band. I typically keep one of my radios on a frequency below 102.9 FM and the second radio is on a frequency between 88.1 and 92.9 FM to maximize logs. Additionally, if you have more than one radio, you could bypass computer recording and use a digital audio recorder or (like I use for extra radios) a minidisc recorder that can record up to 5 hours on one regular 80-minute minidisc. This method is helpful during intense tropo and E-skip openings as you can park your radio on an active frequency, hit record, and get every single station coming in over the course of an opening while you actively DX other radios (connected to the computer as noted on this page) to maximize new logs. Recording audio to your computer is, from what I’ve seen, an easy process. However, make sure the ‘DC Offset’ option, if your computer has it, is NOT activated as you record. I found that this ruins the waveform as seen in Wavepad to the point where you can’t see if signals are coming in upon glancing at the file readout. It also introduces clicks and hiss into the audio which ruins the chances of getting a clean ID. Have any questions about recording DX? Click here to send me an email.